Route in the Silver Peaks range from Jubliee Hut to Mountain Road via ABC Cave and Philip J Cox Memorial Hut. Schist tor • By Matthew. Licence: C.
Mountain Road. This section of logging road is closed to private vehicles. An easy 5.9km road bash leads you to the Silver Peaks Track car park. 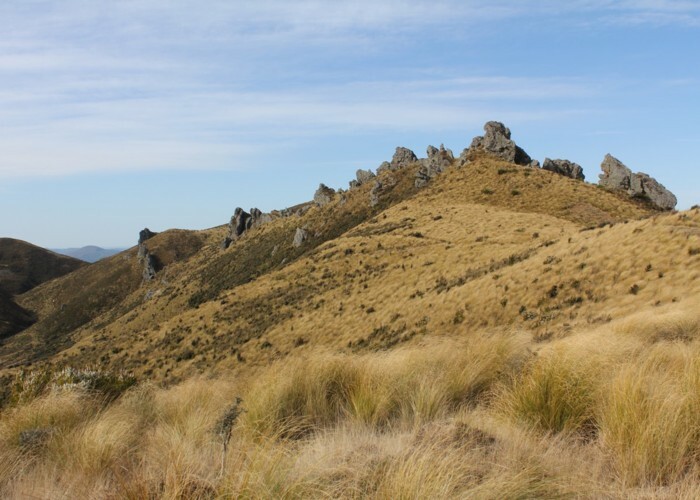 The Silver Peaks are classic Dunedin tramping country. The low altitude range is highly exposed to poor weather, and cloaked in snow tussocks. 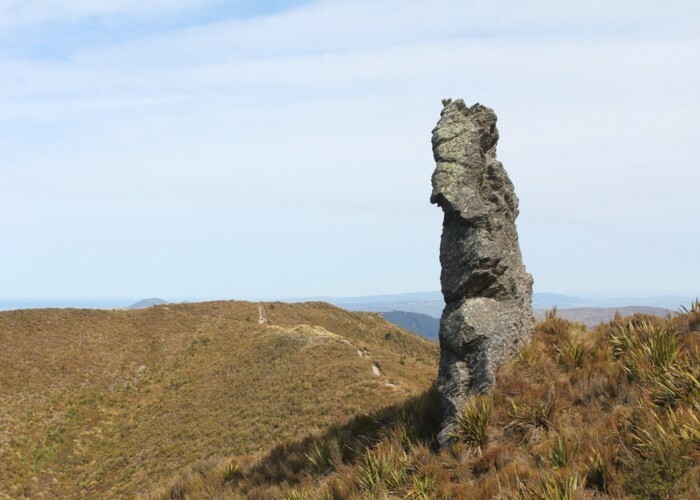 These small mountains behind Dunedin make for an excellent day or overnight trip. Tors near ABC Cave • By Matthew. Licence: C.
The Silver Peaks Route is a continuation of the easier Silver Peaks Track. Combine the Silver Peaks Track, Silver Peaks Route, and a road walk together to make a 25km overnight circuit, well served by two huts and a fitted out cave. Alternatively, the shorter walk from Mountain Road into Philip J Cox Hut makes a good introductory tramp -- if you can face walking the logging road twice. Descending from the hut, the track soon crosses the stream and climbs through scrub. The old hut site is near here, the fireplace still standing in a clearing. The track climbs a spur, coming into snow tussock and joining an old vehicle track for a gentler climb. Jubilee Hut • Standard Hut (DOC). Capacity: 10. Passing Christmas Creek Hut visible across the valley, the track climbs onward, with the ridge ahead marked with an impressive set of rock tors. The ridge line levels off, and the track drops into the valley. Just above the creek, it passes the short turn off to ABC Cave, tucked into the eroded base of one of the tors. The cave is well fitted with a sleeping platform and candle holders wedged into the rock. The track from the cave continues up valley, bending to the right and climbing through tussock. Up and over a high point, the track heads southwest towards Waitati. Descending a spur, the track passes through manuka and scrub with a rich understorey developing just short of the hut. Philip J Cox Hut is small but new and comfortable. Philip J Cox Memorial Hut • Standard Hut (DOC). Capacity: 4. The track below the hut drops quickly through a pretty forest of mapou, lancewood, horopito, broadleaf, the odd podocarp, and the like. Near the Waikouaiti River it becomes quite muddy. The crossing is shallow in dry conditions. Up the true right bank, the track heads into dark pine forest and follows an old road, climbing persistently, and levelling off just before Mountain Road. From here, turn right and take the tedious plod back along Mountain Road to the Silver Peaks Track car park. Added 8 October 2018 by MatthewMatthew. 2 revisions, most recently 9 October 2018 by MatthewMatthew. 197 views in the past year (28 per month).